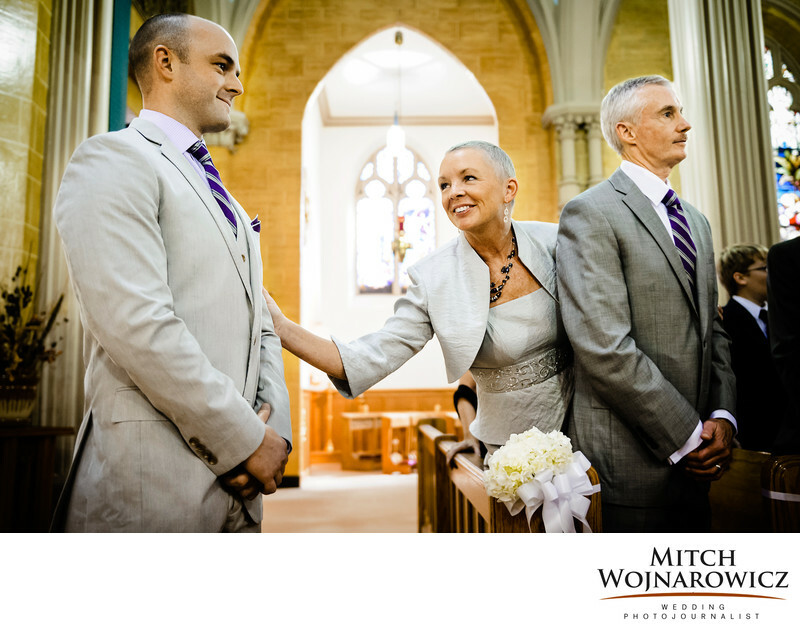 As an Albany NY wedding photographer I focused my attention as the emotional mother of the groom responded with a smile while looking at her son as his bride walks up the aisle for a Blessed Sacrement Church wedding in Albany NY. With decades of experience, I can make the standard images, such as the bride walking up the aisle, then move my attention to the reactions elsewhere, such as this one from the groom’s family. And you don’t have to have 2 photographers to make up for the shortcomings when you hire an inexperienced wedding photographer...With a New York wedding Photojournalist, you'll get so many unposed unscripted and real photos from your wedding. Need offbeat wedding photo ideas? Want wedding photos that aren't ordinary? A wedding photojournalist like Mitch Wojnarowicz will bring you so many more real images, ones that his couples have been so happy to have after the wedding is over...After all, you'll have each other after the wedding and you'll have your wedding photos after the wedding...So when you're looking for ash Albany NY wedding photographer, look at the web site of Mitch Wojnarowicz Wedding Photojournalist. You'll get classic posed wedding photos, great formal photos, beautiful portraits and so many more real images from your wedding day.